While technique definitely matters, it’s also important to get the best bass drum pedal your budget can handle. No other piece of drumming equipment sees as much action; this component is in almost constant motion, and unless it works well, you’ll experience problems ranging from physical discomfort and fatigue to poor sound quality. At first glance, a bass drum pedal looks like a pretty basic piece of equipment. Pump your foot up and down on the pedal, and you’ll be keeping the beat. But hold on! It’s not quite so simple. 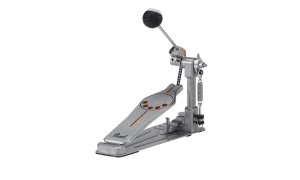 Here are a few things to keep in mind while choosing a bass drum pedal to add to your kit. Direct drive –While direct drive bass pedals tend to be more expensive than other types, this style offers zero sideways flex, and comes with almost no chance of breakage. The feel is firmer and some players find it more responsive. On the flip side, there are some players who dislike the feel, even though durability and longevity are top-notch. Single chain – Single chains are less expensive than other drives, but they have a reputation for wobbling side to side. Double chain – Double chain drives are more durable and offer better stability than the single chain variety. These pedals tend to cost a little bit more, but they offer far greater longevity and reliability. Even so, some players prefer the feel of a single chain. Belt drive bass pedals – Belt drives are a touch smoother and lighter than chain drives, however they tend to be a touch less durable. Manufacturers are now incorporating space-age materials that lend greater durability, so those who prefer belt drive pedals can enjoy them with less concern over breakage. Footboard style – There are a few different footboard styles to choose from. Longboard pedals feature a hingeless design that allows players to rock their feet back and forth. “Short” boards have a hinge at the heel, so all sounds are produced by the toe. Players with very large feet often prefer longboard designs. Single vs. double –Many beginning and intermediate players opt for a single bass pedal, as do many experienced players. This is largely a matter of personal preference; for example, heavy metal drummers who need a lot more power often go for doubles, though there are certainly some who prefer singles. Many find that it’s challenging to work in the left foot, and many others dislike having an extra pedal sitting between the snare and the high hat pedal – they mention that it’s just too much equipment. These are just a couple of pros and cons to be aware of. 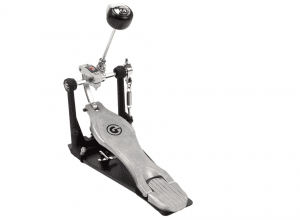 Try a double bass drum pedal if you think you might like it! With these considerations and a few others in mind, here are our top picks for best bass drum pedal. The Drum Workshop DW Accelerator single bass pedal features a dual-chain design and a tri-pivot toe clamp. A Delta II Ball Bearing Hing and a Dual-Bearing spring rocker impart stability as well as durability. The AD4 drive system shortens the length of each stroke, so beats have greater velocity and power. A non-skid design helps keep your foot in place while you’re laying down beat after beat. This DW bass pedal has been redesigned over the years. The current version grips almost any bass drum counter hoop, assuring a solid fit for a good level of stability. A grip located beneath the pedal prevents slipping even when you’re delivering your most powerful performance. Who will enjoy using this bass drum pedal? If you’re looking for an upgrade for a stock pedal, or if you’ve got an older pedal with some issues, you’re going to enjoy the way the DW Accelerator enhances your performance for years to come. Many players agree that this is the best bass drum pedal in its price range, and almost all reviewers are completely satisfied. The Gibraltar 6711DD Direct Drive Avenger Single Bass Drum Pedal features a direct CAM drive for precision and a smooth feel. The chrome foot pedalboardhas a slick surface thatmakes for easy sliding when desired – it’s designed to make doubles easier to play. An adjustable beater angle, adjustable pedal height, and an adjustable hoop clamp help players find the most comfortable, effective position. The beater features dual surfaces – felt on one side, and hard plastic on the other. A memory lock keeps the beater height adjusted when swapping from one side to the other. Underneath, a steel rock plate provides stability. A pair of spur screws let you dig into carpet to prevent slippage. If you’re looking for a smooth, fluid feel with plenty of power, then you’re probably going to love the way the Gibraltar Direct Drive Avenger bass drum pedal feels underfoot. It’s a favorite with drummers who prefer to go barefoot or play in stocking feet; the manufacturers specifically designed it for a smooth feel while reducing the risk of cuts and scrapes. The Pearl P930 Demonator Bass Drum Pedal features a classic single chain drive and a demon-style power shifter function longboard. The dual-surface beater features a control core for simple swapout, and the infinitely adjustable beater angle helps optimize playing position. Click-lock spring tension keepers, a frictionless roller, and a perfect circle cam with a removable eliminator-style eccentric cam footboard make for outstanding versatility and reliable performance. If you’re a drummer who prefers to use a heel-toe technique and you’re looking for a good longboard pedal at an affordable price, then you’ll probably be thrilled with the Pearl Demonator. Despite its low cost, this pedal has a great reputation for delivering smooth, rapid-fire performances for players at every level from beginner to expert. 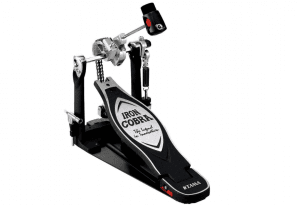 With a wide frame and baseplate for reliable stability, the Tama Iron Cobra Power Glide bass drum pedal features a LiteSprocket design and Power Glide cam for a smooth, light feeling underfoot. The double chain offers ample power and plenty of impressive volume, while the 3-piece hinge guard block provides additional leverage and lengthens the footboard.Tama’s Speedo-Ring rocker cam replaces the traditional nylon cam, adding speed and eliminating friction. A thick, small-diameter beater head mounted on a vari-pitch beater holder assures plenty of range, enhanced control, and powerful attack. A quick hook design eliminates wobble while making setup and breakdown faster and easier.A hard shell carrying case is included. If you’re a die-hard fan of double chain drive pedals and you’re looking for a quality component that will pass the test of time, then look no further. Tama’s Cobra drum pedal is among the best on the market, and it’s got an excellent reputation for quality. While you’ll pay a bit more for this pedal, it will help you deliver your best beats for years to come. The Trick Drums Pro 1-V Bigfoot bass kick drum pedal is made with precision-machined parts including an internal compression spring mechanism that delivers smooth, silent, instantaneous action. The split cam allows players to choose their most comfortable position, independently adjusting the pedal angle as well as the beater. A multiple height adjustment cluster lets you choose stroke speed, and a tension adjustment knob adds even greater flexibility. 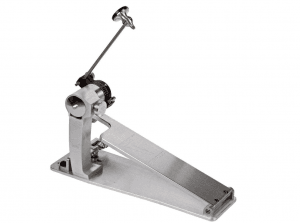 This professional-grade bass drum pedal features Trick Drums’ Slide-Trac hoop clamp adjustment, which makes setup quick and easy. Trick Pro 1-V bigfoot pedals are machined and assembled by hand using components made with titanium, stainless steel, hardened steel, and billet aluminum. Each unit is inspected before being released to the market. If you’re looking for the best of the best and you prefer a longboard style pedal, then your search might be over. 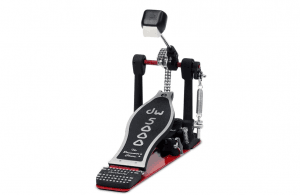 The Trick Pro 1-V Bigfoot bass drum pedal is popular with pros, who love its ability to deliver smooth, exceptional performances even under demanding circumstances. This pedal is built to last; in fact, it may be the last one you ever have to buy. Despite the seeming simplicity of a bass drum pedal’s function, there’s far more to the picture than meets the eye. Every component plays a crucial role in ensuring that your pedal stays in motion with minimal effort on your part; the less you have to focus on this element, the more you can put into the rest of your performance. With quality as our top concern, here are some other things to keep in mind when choosing the best bass drum pedal for your kit. Compatibility:When choosing a bass drum pedal, double-check to ensure that it’s compatible with your drum’s counter hoop. A poorly fitted pedal will slip, leading to problems during your performance. Planned Use: If you’re just now starting out with drumming, it’s perfectly fine to go for something simple, straightforward, and inexpensive. If, on the other hand, you’re drumming for a demanding audience, your kit plays a part in forming your reputation and you’ll want to get the best bass drum pedal you can afford. Longevity: If you go for a pricier pedal, take a look at its reputation. See whether the manufacturer offers replacement parts for cams, springs, and other components that tend to show wear long before other parts. Just like engines and other mechanisms, lifespan tends to have a direct link to quality. Your drum pedal has a direct effect on the way your kit sounds. Luckily, smooth operation, quality components, and great feel, are available at a variety of price points. Whether you’re planning to spend under $100 or more than $300, it’s easy to find a bass drum pedal that’s perfect for your playing style and your budget.